When songbirds endeavor to head hundreds or thousands of miles south they are risking everything in order to find a place that they can winter and hopefully survive in order to head back north and breed. Migration is the single most dangerous thing that birds do and many don’t survive as Greg pointed out in his recent post. Humans have made migration much more difficult with our roads, our huge glass buildings, our rapacious appetite for development, our introduction of predators. It is a wonder that any songbirds survive at all considering the changes we have wreaked on the landscape. A recent visit to Fort Tilden, on the coast of Queens, provided two examples in about fifteen minutes of how difficult it is for songbirds to find their way south. Another recent visit to Kissena Corridor Park in central Queens provided a couple of more examples. 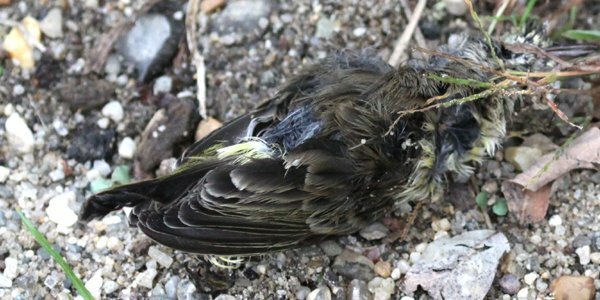 A warning – there are some graphic images of dead birds in this post. If you don’t want to see such things may I recommend checking out something cute? It somehow seems unfair that a bird that that has lived through innumerable dangers from when it was born, through its first migration south, a full winter, another migration to the north, breeding season, and another trip south could meet its end in the mouth of a cat. But that is what I believed happened to this Common Yellowthroat which I found dead in Kissena Corridor Park which has great habitat for birds but also hosts a feral cat colony. Please, keep your cats indoors. 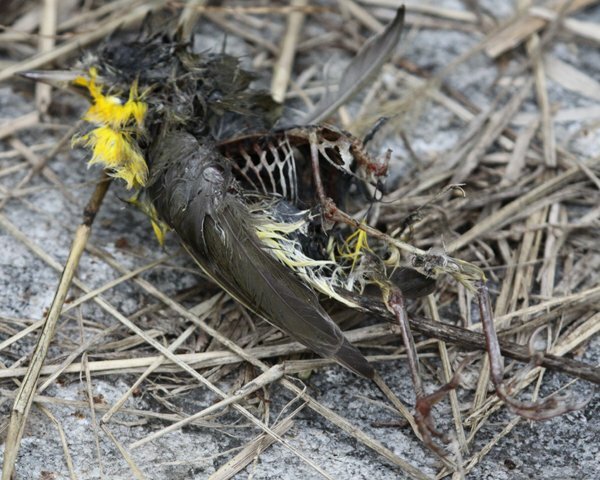 Another major hazard for migrating birds is roads. Some birds mistake a wet road for a river and entire flocks of loons and grebes have been known to crash land and be stranded on pavement. But even more dangerous are cars. Here an American Crow flies off with the remains of an unidentified bird that was crushed by a car. Some birds die anonymously on their long trek – unmourned, unloved, and unknown. I think this was once a Yellow-rumped Warbler but I failed to examine it carefully, wanting to focus much more on living birds. I don’t know its cause of death but I suspect it might have been the plaything of a cat in its final moments. 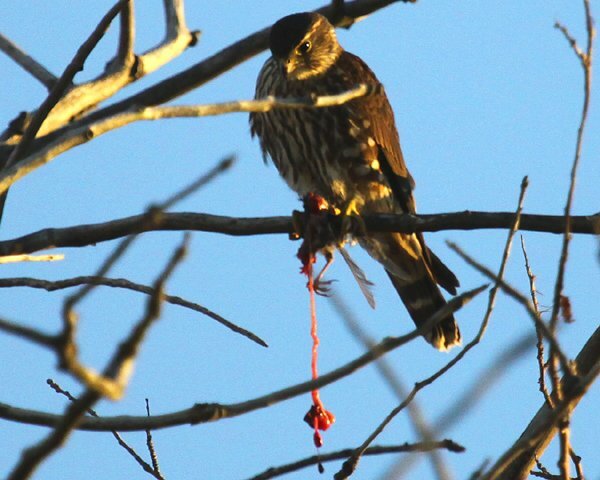 No other predator that I know of in North America kills and sometimes leaves its prey entirely intact, uneaten. What really bothers me is when people take issue with hawks and falcons taking songbirds and try to blame the decline of songbird species on the rebound that birds of prey have experienced since killing them for sport or poisoning them with DDT became illegal. Songbirds have migrated through the gauntlet of natural predators for millenia but it is only in recent times that they have been crashing, largely because of habitat loss and the barriers we put in their way. 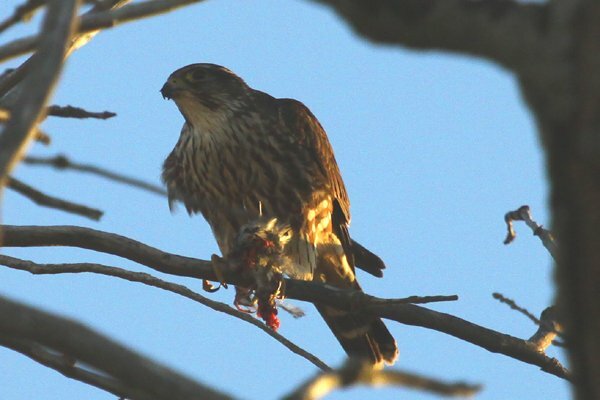 If a songbird must die on its trip it seems only right that it should fuel another migrant bird, in this case a Merlin at Fort Tilden. Birds migrate. Many die. Let’s try to make it as easy as possible for them by keeping cats indoors, providing habitat, and not stressing birds as they make their way to their wintering grounds. We do want birds to be successful so our children and grandchildren can appreciate them too, right? I certainly agree than wherever we can eliminate a human-made hazard to birds we should . But it’s interesting to reflect that even before human factors came into play how risky is the first year of life for a bird. I often illustrate this by pointing out to non-birders how many offspring an adult bird produces just to replace itself & thereby maintain a stable population. Two mallards for example over (say) 3 breeding years would produce around 30 eggs/young – just to replace themselves. Why do they capture so many migrating birds in mist nets and band them? They are only adding to the stress the bird is already experiencing and altering their behavior. Migrating banding stations capture thousands of birds every season and most all of those birds are never seen again. It is another example of humans putting up road blocks and telling themselves they are doing it for the better good. Hear hear, Nick! The Chicago Bird Collision Monitors (http://www.birdmonitors.net/), which I’ve just started working with, don’t just rescue/retrieve fallen birds, we advocate for better building behavior during migration too. Glad that DC is also a leader … and Audubon spotlighted the Minneapolis program on their blog recently.